September 23, 2011. Lucky me, to have a Traildriver today! (Different than a slavedriver, of course.) Mary Rasmussen brought her knitting and reading to do while waiting for me to accomplish the Great River State Trail. How nice to be dropped off at the beginning and met at the end, so that I didn't have to double back. And from Mary's body language, nobody will mess with my stuff! On the way down to Onalaska, Wisconsin, where the trail starts, we checked out where the trail ends, so that Mary would know where to meet me. This was a good thing to do, because the end of the trail is rather obscure. It looks like someone's private driveway, but it leads to a parking area for the trail end. See? It DOES look just like someone's driveway. The drive down to either the trail head, or the trail end is beautiful. Take WI 35, which runs along the Mississippi. To shorten time, Interstate 90/94 (taking 90 off I90/94 to LaCrosse/Onalaska) could be used (north/south) to connect to Hwy. 35, but since we were coming from the north (Menomonie) we took state highway 25 to Hwy. 35, and enjoyed the river drive. It really is one of the spectacular scenic drives anywhere in the USA. The little river towns are historic and so pretty. There is a sign, but it is easy to miss. Looks like a driveway, right by someone's garage! This is what you will find after driving less than a block. After establishing where I would end up, we proceeded to the beginning of The Great River State Trail. The beginning can be a bit confusing too, as I will describe, but I have already done the getting lost..............so YOU won't have to. Driving to Onalaska from the north on Hwy 35, get off on Business 35 to go through the town of Onalaska at the first exit to do so, otherwise you will miss the trail head and have to approach it from the south, most likely having to go through LaCrosse and turning around. Just remember to get to the trail head, go on Business 35, not the Hwy 35 bypass. This helpful sign on Business 35 tells you where the trail information center is. Be aware that the Great River State Trail Visitor Center is NOT the trail head. Ha. I told you that finding the end was confusing...........and also the beginning. But I will explain all mysteries. You can certainly go to the Visitor Center, because the helpful people there will tell you how to find the trail head which is about...........a half mile?..........away. When you drive down Bus. Hwy 35 from the north, and turn left (east) on Main Street, be patient and just keep going. The Visitor Center will appear on the left side of the street. The Visitor Center used to be located on Oak Forest Drive, but not anymore. This is it, and you know EXACTLY what corner it is on. Go inside. Buy a trail pass, get a trail map, or other area info. Use the "facilities". The trail head is alongside Bus. 35 (also 2nd Avenue South) just a block south from the Main Street and Bus. 35 intersection. Find the trail head parking area on the corner of 2nd Avenue South, and Irvin. Park here! The trail starts at the north end of the parking lot. Dressed in orange for hunting season, and ready to hit the trail. Notice that I am wearing orange. Bow season or not, I feel that being visible is a good thing. Besides, guns on the trail were present, since squirrel shooting was going on. I feel that I do not resemble a squirrel, but I take no chances. The long and (not) winding road. 24.4 miles. Beyond the shrubbery, next to the river: the railroad and many trains. The Great River State Trail's big feature is................THE RIVER! You guessed it. You will see it for much of the trip. If you don't see the Mississippi, you will cross other rivers that join it, view the river bottoms, and experience many trains, since this is a major freight corridor. At least two trains an hour. Going north, the tracks are to the left, sometimes visible, sometimes you just hear it. The trail features environmental and historical info about the area. The trail will cross small highways multiple times, and will cross Highway 35 in Trempealeau, so stop and watch for traffic. The small community of Brice Prairie. Mileage markers are a good thing. Encouragement! "I hear that train a-comin', it's comin' round the bend.........."
Watching freight cars makes clear China's trade dominance. Lytle's Landing, another one of the many places to access the trail. After Lytle's Landing, the Black River delta lay ahead with bridges crossing streams, and miles of wetlands in the Van Loon State Wildlife Refuge. Here I encountered the sounds of gunshot, and I was glad to be wearing the orange. I met a number of cyclists, all wearing dark clothing that blended in with the surroundings. Maybe I am overly concerned, but why not be visible? I am unfamiliar with the rules about hunting, where one can/cannot shoot. I met two fellas on the trail, toting rifles of some sort, and it looked very much like they were shooting right from the trail. Squirrels. Black, gray, red squirrels........they held no prejudice to squirrel color, said the guy with no front teeth. His spiky haired companion agreed. Miles of river bottom surrounding me, I just exchanged pleasantries, and hoped I bore no resemblance to a squirrel. When crossing the Black River, get off your bike and take in the view. What a wonderful private spot to live, and enjoy the sand bars. Maybe other kinds of bars too, it's WISCONSIN! Looks like a great swimmin' hole. I then encountered one of the most charming and romantic sights. This man has an imagination. I think that bodes well for the future relationship. She said yes, right? Say yes, Stacy, say yes! He left without his hat. The first day of fall (autumnal equinox) and it is beginning to look like it. Of course, you know that I cannot post trail information without a photo of poop. Since my bear encounter on the Gandy Dancer State Trail, I've been a little obsessed with evidence left behind by bears........or wolves.........or, who knows? Bear poop? It has corn, kinda loose..........I think bear. Any wildlife experts, please use the comment section. I welcome comments from all, not just poop experts. Let's take a vote. Bear, wolf or dog. Imagine. Two thousand years ago. The Hopewell tradition. Cross Hwy 35 here in Trempealeau. Maybe time for a break at 14.3 miles. Since this is a good more-than-half-way point, you could bike the short distance into Trempealeau and have a drink of some sort, a potty break, and see the sights. The sign at the Hwy 35 crossing. Perhaps you want to see the hotel. And here it is! Quainty. Bike the short distance to the west to the old down town area. It won't take long, it is small, but charming. Views of the Mississippi, of course. Enough fooling around. Wipe that beer foam off your nose and hit the trail. More than half way here. Just about ten miles left. The landscape opens up to wider views. Trempealeau behind. Perrot State Park to the left. More wildlife refuge ahead. Here is another odd bit. 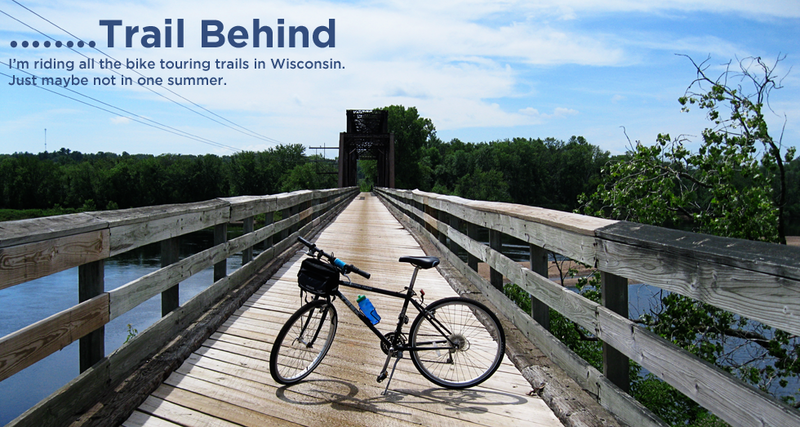 For a few miles, you will actually be biking on a small road in the Trempealeau Wildlife Refuge. The "trail" goes down a hill (you get to coast!) to the west. Just follow it. After a bit it becomes a trail again. View the following photos, you'll see. At this point, the trail turns into a bicycle turnpike, with four lanes. For some reason. Whatever. I took the high road, because that's what I do. Marshland to the left, marshland to the right, and the town of Marshland ahead. During this time, I was hearing continuous gunfire. There must be a shooting range nearby. I was a bit apprehensive, imagining stray bullets, but this did not happen, and I am here to blog. Happy about that. Trails end. No bullet holes. Mary was waiting in the car, knitting and reading. She was knitting a hat for me! I have it now, it is colorful, Norwegian looking, warm and quirky. Kinda like Mary. In good weather, sit on the patio. And then we strolled around the town. 'Cause we can. Usage: (Summer) Biking, hiking, non-motorized. (Winter) Snowmobiling, cross-country ski (ungroomed). Signage: I appreciated all the environmental information. Many historical signs, and yes: mile markers. Regional trail system: 4 trails in the southwestern area: Elroy-Sparta State Trail, the Great River State Trail, the La Crosse River State Trail, the 400 State Trail. See the link above for Friends of the Four Trails. Rest stops: Onalaska, (the Visitor Center, numerous gas stations, restaurants) Brice Prairie (porta-potty), Lytle's Landing (porta-potty), Trempealeau (toilets, and the town offers gas stations and restaurants, coffee shop), and there is a supper club in Marshland, but it is a supper club. Not always open, you know. Those are the facts, Jack. I really like this trail, and the drive home along the river can't be beat. Mantra: I may not get there first, but I'll get there. Because the intention of biking all the Wisconsin state touring trails was confessed to the Bike Shop Boys, I have to follow through. I'm 58, out of shape, have creaky knees and grandiose ideas. I won't get there first, but I'll get there.